It’s beginning to look a lot like Christmas! I am SO excited!! This year Christmastime will bring so many gifts to my family and I! During the Christmas season we’ll be welcoming our fifth baby boy into our family and I will finally get my boot off of my broken foot and be able to walk again! YAY! How’s that for an eventful Christmas!? 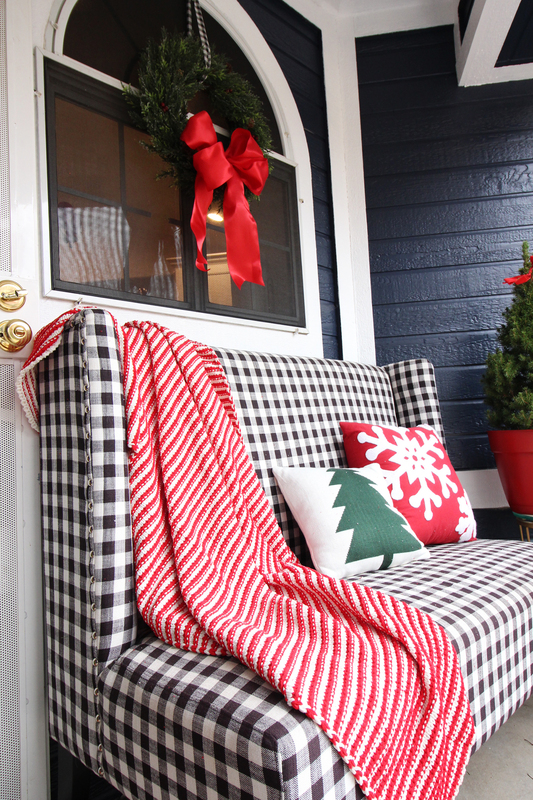 To get into the spirit, I headed to JOANN and grabbed some festive items to give my front porch a makeover! 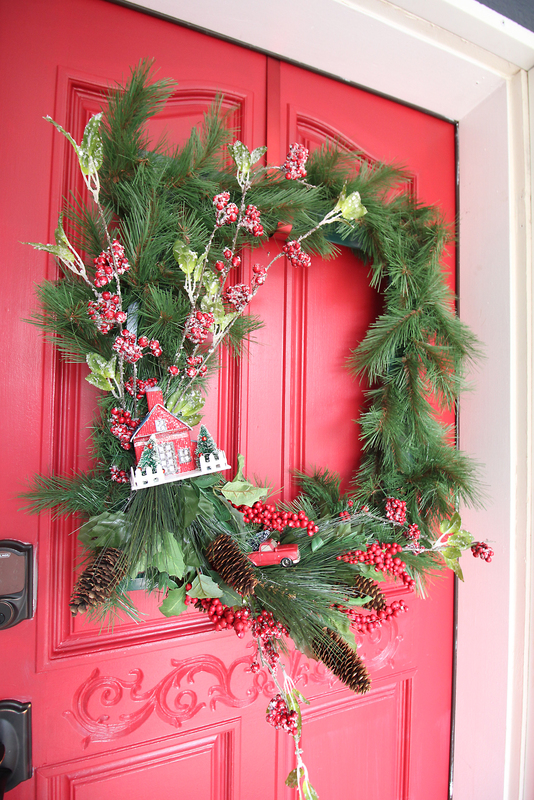 I wanted to make a new wreath to compliment our newly painted, red, front door! 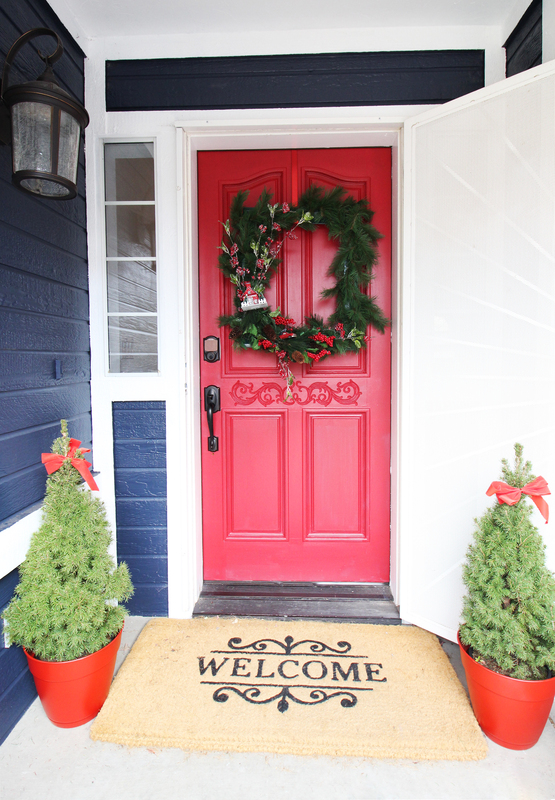 We painted our house navy blue over the summer and I have been itching to paint the door red and it was perfect timing for the holidays! For the wreath, I was leaning toward something traditional but we wanted to put a unique, modern twist to it so Savannah and I decided to make a wreath out of a picture frame! 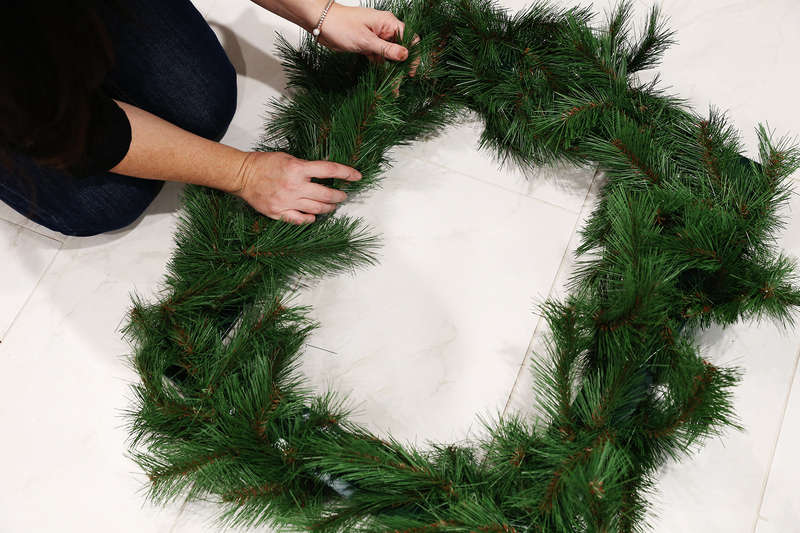 I absolutely LOVE the rectangular shape to put a twist on an otherwise traditional wreath! 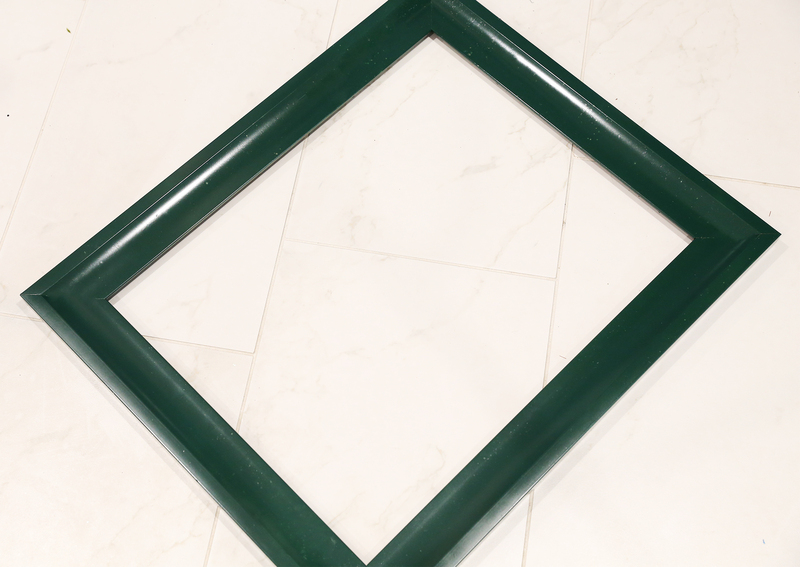 We removed the glass from our frame and spray painted it green. We wrapped the garland around the frame and secured it with floral wire. 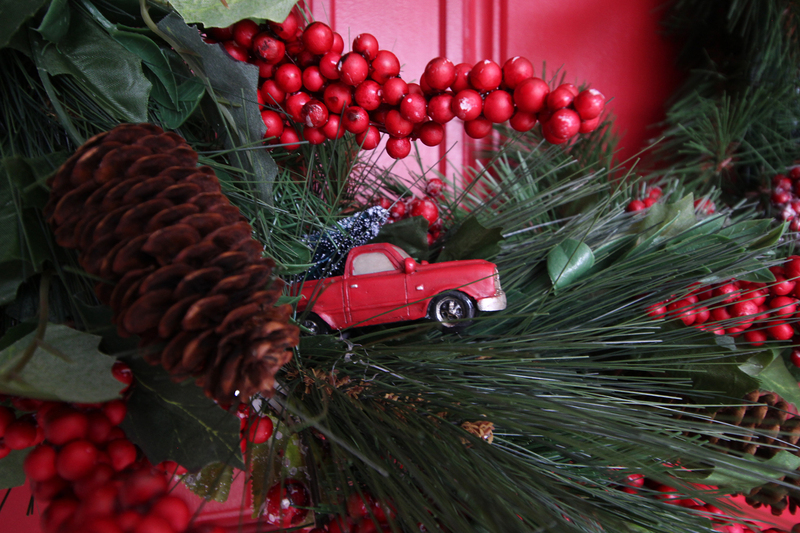 Next we added some floral stems with different berries, the little red truck and the Christmas house to the garland and again secured it all to the frame with floral wire. 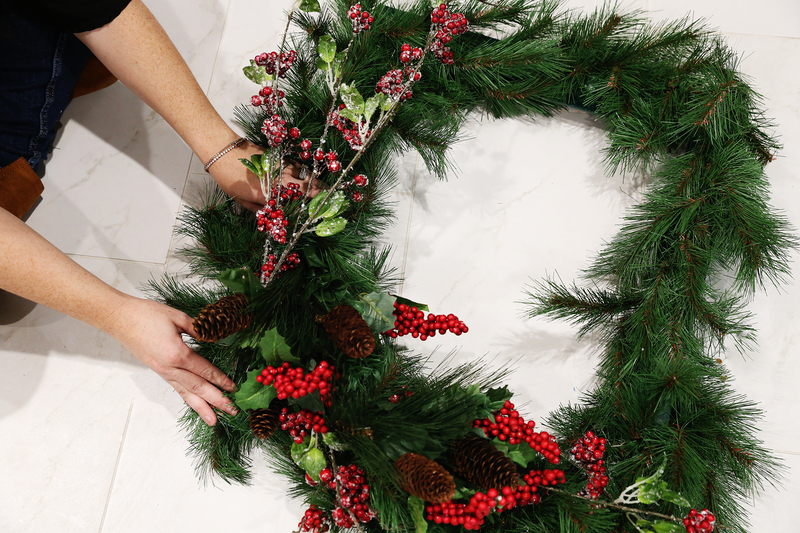 That’s all for the wreath! Easy and adorable! 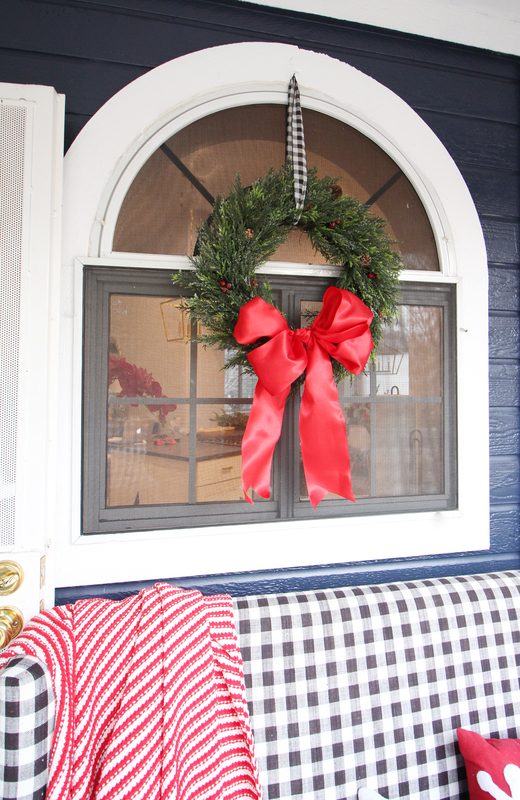 For the rest of the porch, I added a wreath and tied a simple red satin bow to my front porch window. 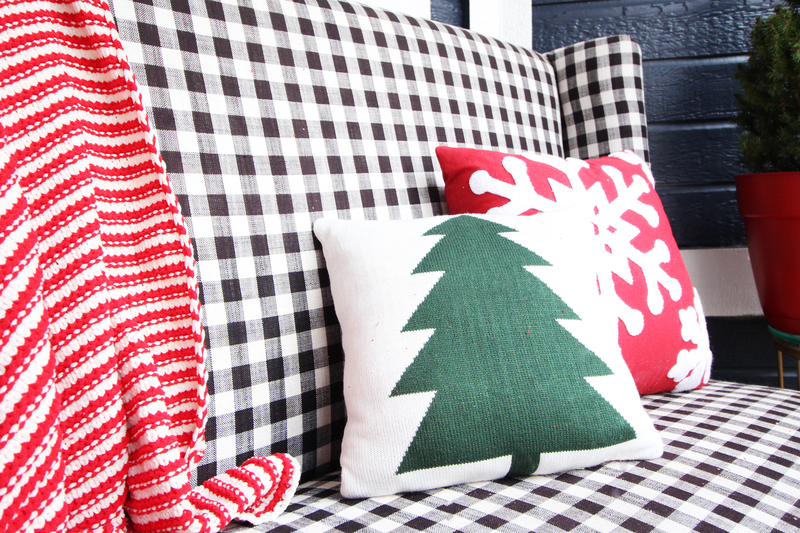 We always keep this little black and white settee on our front porch so I got this tree pillow, snowflake pillow and striped throw from JOANN to make it a little more festive. 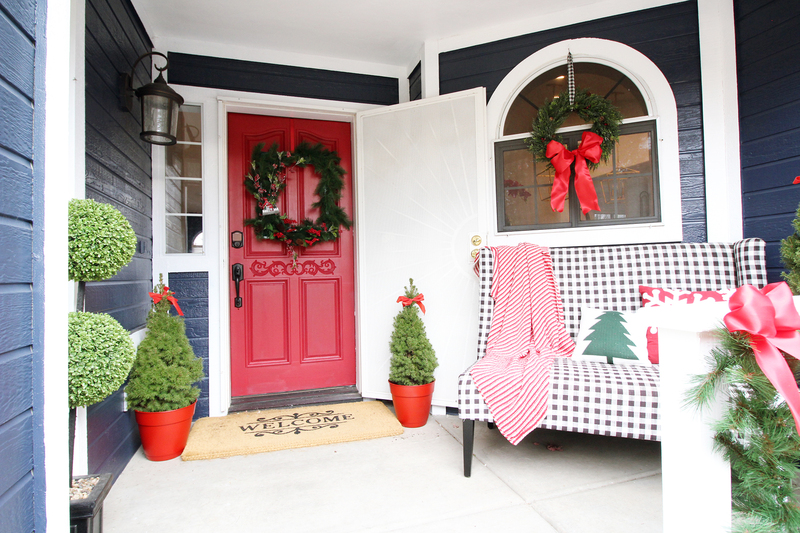 I picked up some fresh dwarf Christmas trees from a local nursery to add some live greenery to the front porch space. 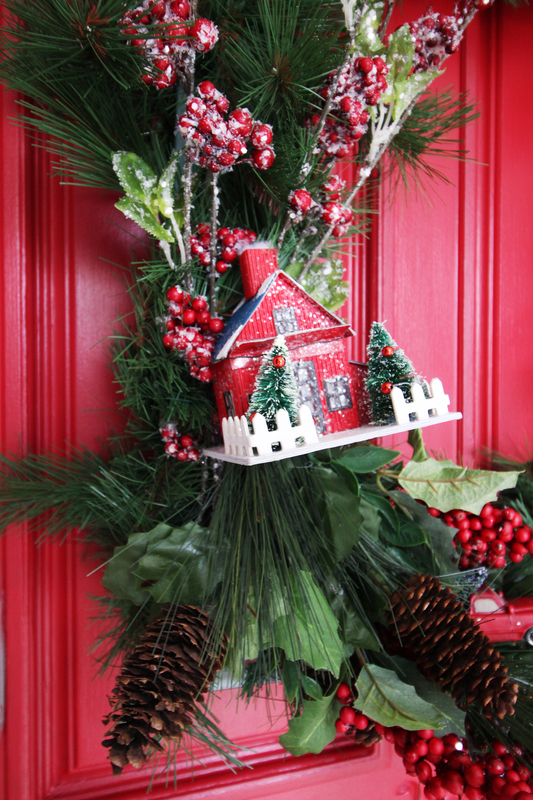 Finally, I attached another 9 ft garland to my railing using floral wire and tied on satin ribbons to dress it up a bit. 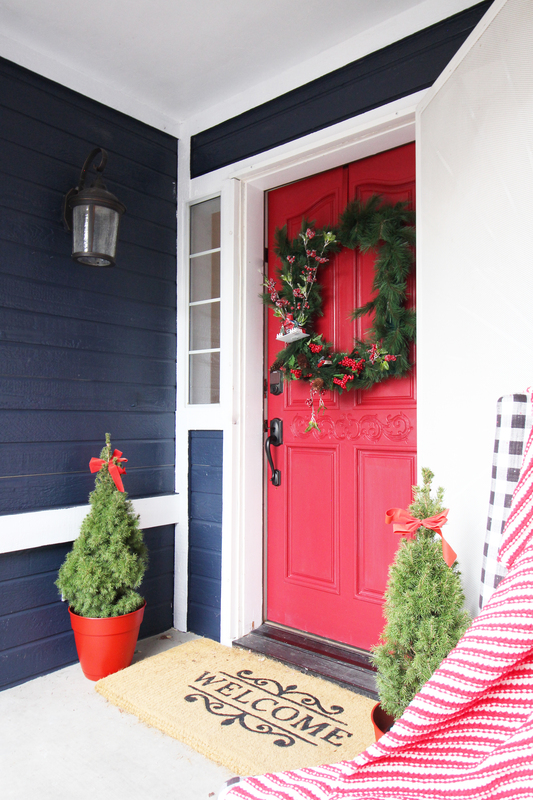 I am so ready for Christmas and I love how the items I found at JOANN really made our home look festive and inviting for our guests this season. Hey Mallory, your fall porch is so pretty. I always enjoy seeing your decor and creative ideas. 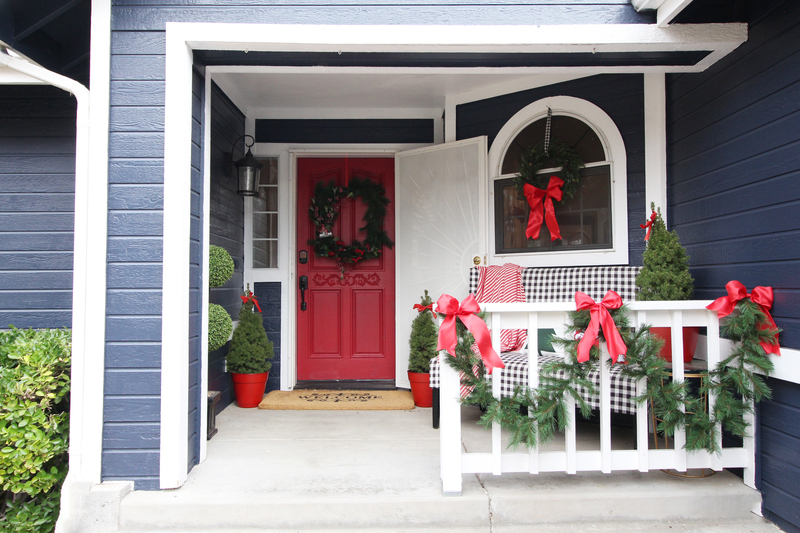 I am so ready for Christmas to decorate our home with these ideas. Thanks for sharing such a nice post. 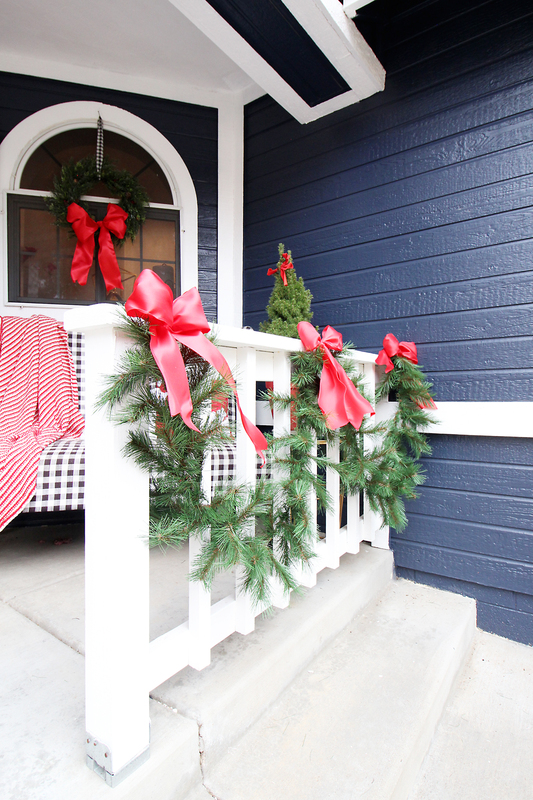 Mallory, I love the exterior navy color! I have searched and searched but couldn’t find the name of paint color you used. Is it Hale Navy by BM? You and Savannah are so inspiring-it’s amazing how much fun you seem to have while working so hard AND raising 9 kids.